Post pastel pieces or talk about anything having to do with pastels. Hi All, I am new to this site! I thought I would post one of my Pastel/Colour pencil paintings and see what you think..
cant type, cant spell... not much I can do! This is great Marie ! I like the bubbles .. lets us know what the dog is looking at ! I like your website too - lots of variety. I hope you post your next w.i.p. . Thanks Brendan, glad you liked the picture and my web site. 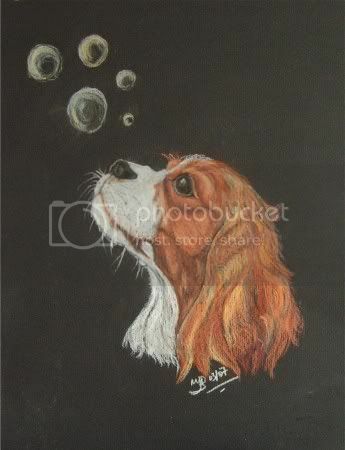 The dog was looking at a hand holding a daizy, but this did not look good for the painting, so I changed it to Bubbles..
Like your drawings Brendan they are great! Posting a wip keeps you from abandoning a work before it's finished ! I'm open to criticisms...keep them coming. CLICK to go to the LITTER BOX. IT IS NICE TO BE IMPORTANT ..... BUT IT IS IMPORTANT TO BE NICE. This is cute. How did you like working on the black paper? I bought some a while ago, just haven't got to work on it yet. Nice work.